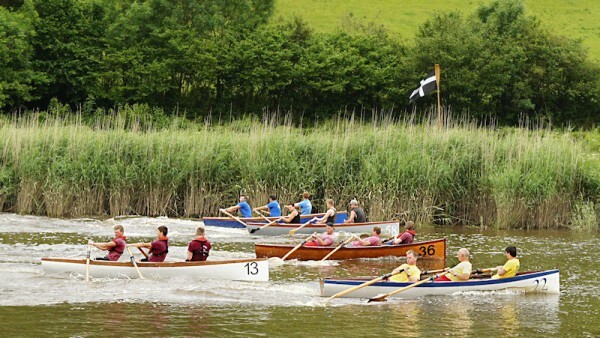 The hounds and I went to Calstock regatta today. We parked at the National Trust carpark at Cotehele house, just in case it was busy, and walked along the river to get there - but in the end, it was fairly quiet, for an event. Good for Rosie's social skills. We got there just in time to see the second race coming through the pillars of Calstock Viaduct. I hoped the train would go over while the boats were underneath, but no luck! That's the safety boat painted white on the left. It waved at me cheerfully when it saw I had a camera. I waved back. I'm told that they once used to race all the way down to the mouth of the river - 18 miles! Although I think that would probably be in full-sized gigs, not little flashboats. But this course was only about half a mile, I think. 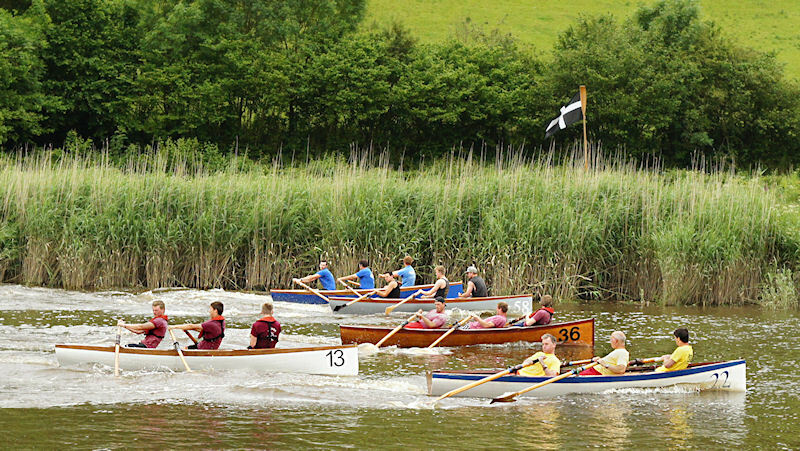 People had brought their boats from several clubs across Cornwall to compete. This is the Polperro team getting their boat into the water. 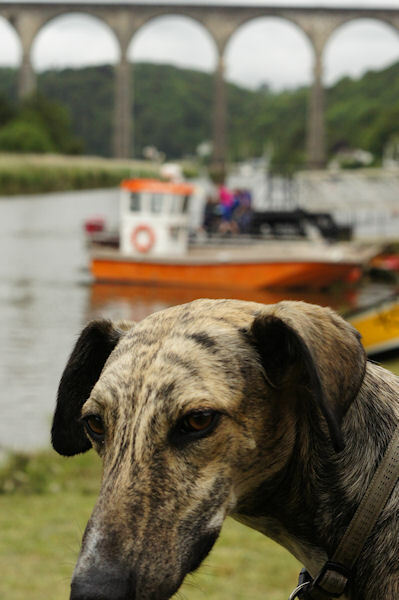 Brythen looking unimpressed by all the rowing, with the Calstock Ferry in the background. I keep meaning to go across on the ferry, now that it exists again (the Calstock Ferry has a somewhat troubled relationship with existence, but currently it exists and is very orange.). The Men's Cornish race getting started, with a Cornish flag in the background (slightly oddly, since that is actually the Devon bank, but I assume it's a marker?) 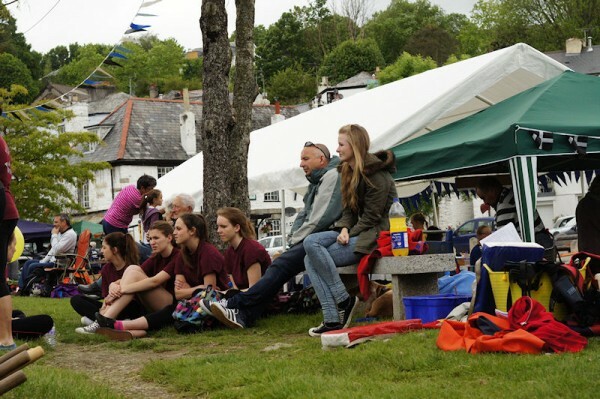 The blue team in the background are Calstock, the local team with the loudest cheering. The dark red ones were Saltash, from the mouth of the same river (although sadly they came by car rather than by boat!) 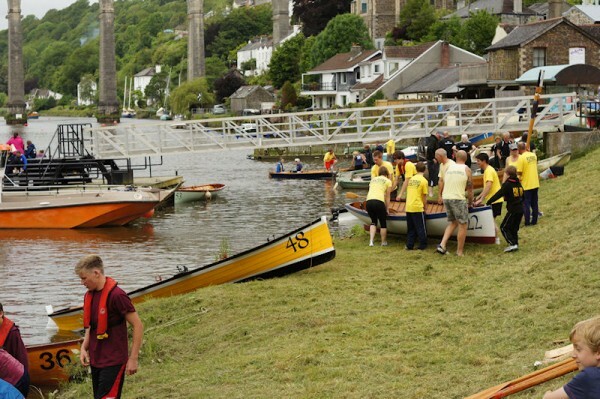 The yellow was Polperro, I think the black t-shirts might be St Germans but I can't remember the pink team. There was a lot of cheering. There was bunting and a barbecue and cake! I and the hounds all had Meat Inna Bun and it only cost us a fiver. Then I bought two cakes, to take one home for Pp, and it only cost £1! In between races, I went around ogling the boats. Isn't this a really beautiful piece of woodwork? 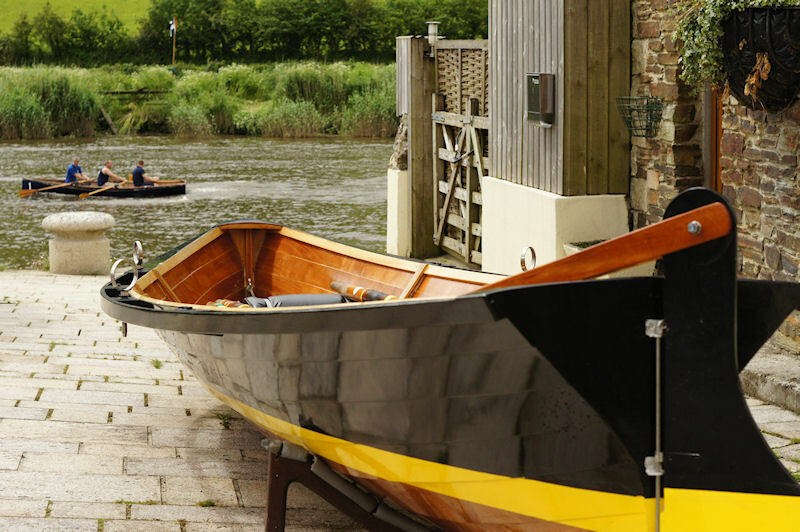 I *think* all the boats racing were flashboats - which is apparently an adaptation of the standard 19th century small wooden working boat to be faster to row, at the expense of stability. They make me think of Vikings. 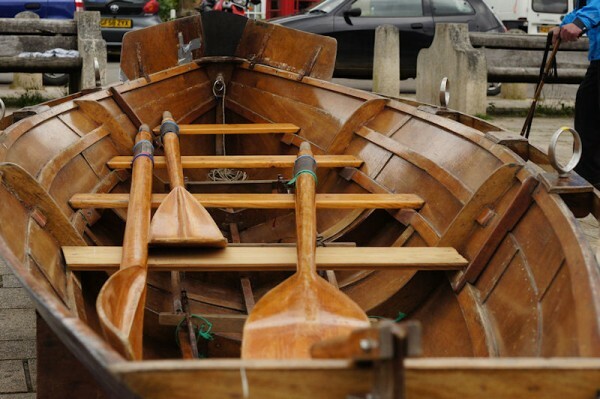 All of the racing boats were wooden, but not all of them were so lovely as this one. The river is not *that* wide at this point, but none the less, there were plenty of people on it other than the racers. This, which I think may be a reconditioned old trawler? came past between races. The canoeists were out in force too. 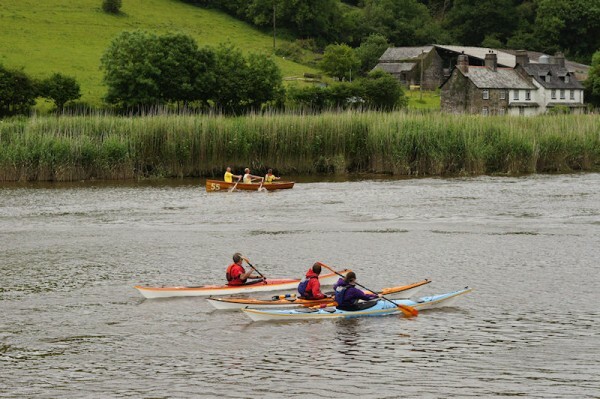 A boat coming in at the end of the race, and canoeists watching it. 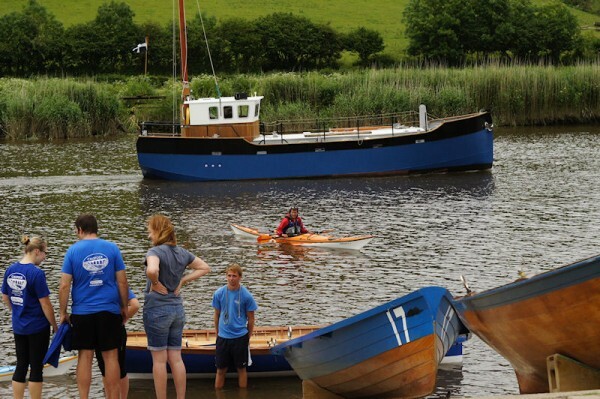 As I was leaving, the tannoy was announcing a race which would have nine boats competing, and the tannoy was warning the competitors not to crash into each other. 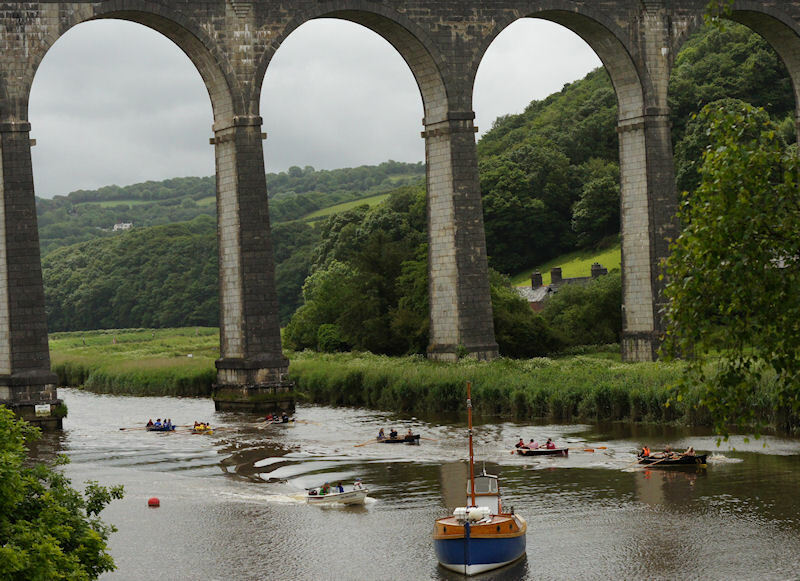 As I walked back along the river, I saw two motor yachts powering along on their way up to Calstock. I hope they slowed down in plenty of time before meeting the nine boats racing down the river. Isn't this just beautiful? Look at the lines. OK, it looks like it's probably alarmingly unstable and the thought of all the sanding and painting to keep it looking like this makes my knuckles feel sore just to look at it, but still. Wow. There's more racing tomorrow, I'm tempted to go again. Those are some beautiful boats. And I love the arches on the viaduct, too: so dramatic. Those are certainly beautiful boats. :-) Thank you for the pictures, it's always interesting to see these local events. That sounds like such a wonderful day out. Particularly the bit about relaxing on the bank eating cake while out on the river the crews are straining every sinew.